Starting Jay Cutler paid off for the Bears, but would a long-term deal do the same? 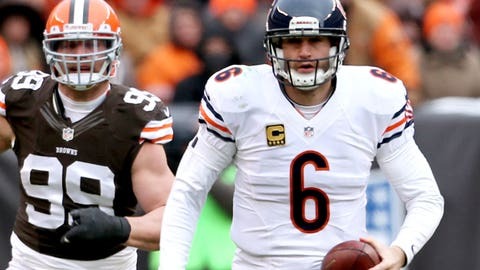 I was in Cleveland on Sunday to call the Bears-Browns game and while the contest itself was awfully important for Chicago’s run at the playoffs, it was Jay Cutler’s return that was dominating the headlines. After missing the previous four games with groin and ankle injuries, Cutler was named the starting quarterback — his first start since Week 10. There was an ongoing debate whether it was the right move to bench the hot Josh McCown for the potentially rusty Cutler. To Marc Trestman’s credit, the decision was easy. Jay Cutler is his starting quarterback. Plain and simple, if he is healthy enough to play, then he plays. In the five games without Cutler, the Bears were a pedestrian 3-2. With him, 4-4 — and now 5-4. McCown has a better completion percentage, more yards per attempt and a far better passer rating. But the biggest discrepancy between the two starters is their touchdown-to-interception ratio. Both had thrown 13 touchdowns (McCown in three fewer games) while Cutler had thrown eight picks to McCown’s one. When looking at turnovers as a whole, Cutler added another three fumbles lost and McCown just one. Clearly, the debate was justifiable. In fairness to Cutler, it wasn’t the best conditions to be making his return. For one, the Bears entered the game deadlocked with the Lions atop the NFC North but with the Lions holding the tiebreaker, there would be no room for error with just three games remaining. But worse was the weather in Cleveland — a temperature in the mid-20s with a wind chill making it feel more like 10 degrees. The temperature would make it tough on Cutler to keep his groin and ankle loose, but it was the swirling wind that was more concerning. The flags placed throughout the stadium would be flying in one direction at a given minute and then in the complete opposite direction the next. At the same time flags on the upper deck of the stadium suggested winds from the west, flags on the goalposts were showing wind from the east. This makes it extremely difficult on a quarterback to maintain his accuracy and touch on the ball. No matter the direction, a quarterback can typically deal with the wind, as long as it’s steady. That wasn’t the case in Cleveland on Sunday. Chicago received the opening kickoff and Cutler put together a 54-yard drive and had the Bears all the way down to the Cleveland 14-yard-line before doing what he couldn’t afford to do. He threw a pick. As I said on the broadcast, it wasn’t a terrible read. In hindsight, would checking down to his third option (who was very much open by the way) have been better? Yes. But he had his first option a full stride ahead of his defender in the end zone. You can’t criticize the decision. But the throw — that’s another story. It was high and behind Brandon Marshall, who can typically make the appropriate adjustments to poorly thrown balls, but this time, it was tipped and picked. Missing high became a theme for Cutler on the day. I can’t say for sure if it was the windy conditions that got the best of him, but it surely wasn’t helping. His second pick, early in the second quarter, was also a high ball to Marshall that was tipped, and it was subsequently picked and returned for a touchdown. Cutler had now thrown two interceptions in just three possessions. That is more interceptions than Josh McCown had thrown in his five starts combined. Cutler finished the day with 265 yards, three touchdowns and the two interceptions. He probably should have had a third interception, but Alshon Jeffery turned it into the momentum-changing play of the day. Jefferey took advantage of a poorly timed jump from the first Cleveland defender and used his body to shield the second to catch Cutler’s longest completion of the day, a 45-yard touchdown. But let’s be honest: Jeffery has bailed out McCown a fair amount of times as well the past couple of weeks! Because the Bears won, Trestman made the right decision. Had he lost, those postgame questions would have been much more difficult to answer. Instead, the Bears now put the pressure on the Lions to keep pace in the division and the Bears can shift their focus to the final two games on their schedule. But the debate is far from over, just delayed until the offseason. With Cutler and McCown both becoming free agents at the end of the season, who will they move forward with? With Cutler most likely looking for the next $100 million contract, McCown is clearly the cheaper option and that extra money could be very beneficial to a defense that has a lot of holes to fill. Or is Cutler worth the extra money? The market will inevitably drive the price and with quarterback-needy teams like the Texans, Raiders, Browns, Jaguars and Vikings, might he be able to get that contract somewhere else? I’m not sure McCown is the long-term solution for the Bears, but I’d be very apprehensive to pay Cutler among the likes of Joe Flacco, Matt Ryan and Tony Romo. Each of those three joined the $100 million club this past offseason and for my money, I’d pay all three of them before Cutler. But timing is everything in the NFL and good quarterbacks aren’t just crawling out of the woodwork. Someone will pay him just because he is the best available guy on the market. The question remains, will it be the Bears?